Editor’s Note: Report released January 2, 2018 due to the New Year’s Day holiday. 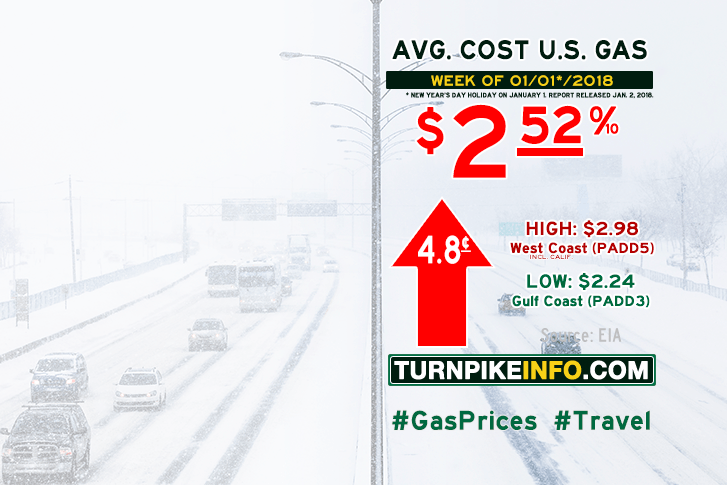 Fort Lauderdale, FL – Gas prices started the new year with a shocking increase, according to the latest pricing survey from the U.S. Energy Information Administration. The E.I.A. reports the nation’s average cost of a gallon of regular unleaded surged nearly five cents per gallon to $2.52. That increase as more than twice the price hike seen a week earlier, which greeted drivers making last-minute Christmas rounds. Drivers in nearly all regions suffered with higher gas prices, including some weighty increases in the Lower Atlantic states and along the Gulf Coast. Despite a seven cent increase in that region’s average fuel price, the Gulf remains the cheapest place to get gas. Only the Rocky Mountain states enjoyed a slight price dip, of just over one penny per gallon. Truck drivers took it on the chin this week, by the E.I.A. survey report results. The nation’s average cost for a gallon of diesel surged by seven cents per gallon, pushing the national average to $2.97. Fuel prices for all regions are shown below, as gathered from www.eia.gov.